Active Pest Solutions has a proven track record in ant control in Fife, Perthshire and Kinross-shire, where ants often cause problems from early springtime through to late autumn. We have over 15 years’ experience of dealing with pest ants in both homes and businesses, using professional ant control products and techniques at very competitive prices. As members of the Fife Trusted Trader Scheme and Perth and Kinross Better Business Partnership, our working practices, pest control qualifications, customer service and integrity have been checked and approved by Trading Standards officials, so you know we’ll deliver ant control you can trust. Over the past 15+ years, we have undertaken successful ant control in a wide variety of situations in Fife, Perthshire, Kinross-shire and Clackmannanshire. During that time, our pest control operatives have solved ant problems in private houses, nursing homes, corner shops, large manufacturing premises and many other locations. 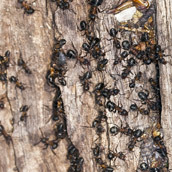 Residual sprays can be used around ant nests or as barriers to help prevent ant infestations. Gels and bait formulations will be carried back to the nest by worker ants, killing the colony. Insecticide dust applications are effective when a nest is found and exposed. Ant proofing may be done to prevent ants entering a building. Whatever your ant control problem, we’ve almost certainly already dealt with one that’s similar, so if you’re looking for help, make us your first port of call. Clear away any food or spillages from worktops and floors, especially sweet sticky substances. Cover all food sources or use airtight containers. Clean and disinfect behind appliances and under work areas. Block pest ants from entering a premises by insect proofing all cracks and crevices around walls, doors and windows. Ants can make life fairly unpleasant – whether they’re infesting your food cupboards or crawling up your legs while you chill on the patio. If you have an ant problem of any type at your home or business premises, call in the professionals straight away. Ring Active Pest Solutions on 01577 862035 now or send us an email. Pest control surveys undertaken by a fully qualified technician. 15 years of ant control experience. Regular ant control service visits to protect you and your business. One-off ant control visits to businesses or homes.